If you want to convert your home to air source heat pumps, the installation cost will depend the type of heat pump system (central vs. ductless), how many rooms you need to heat or cool, and the size of the living area. Generally, the operating cost of air source heat pumps is lower than traditional home climate systems that run on gas, oil, or other common fuels, making them a smart financial decision for many homeowners. Their high efficiency also comes with environmental benefits – especially if you power them with solar electricity. How much does a heat pump system cost? As a rough estimate, you can expect a ductless air source heat pump installation to cost between $3,500 and $5,000 per indoor unit installed. Central heat pump systems cost between $12,000 and $20,000. Depending on where you live and the type of air source heat pump technology you’re installing, there may be tax credits and rebates available to decrease your upfront costs. For example, Massachusetts operates a Clean Heating and Cooling program offering rebates of up to six thousand dollars for homeowners who install air source heat pumps. Local installers will be able to provide more information about the incentives available to you. Total installation cost for heat pump systems depends on the type of system (central vs. ductless), system size, quality of equipment, complexity of the installation, other services included and any extras that you may want to add. Your installation cost will depend on the size of the area that you want to heat and cool. For ductless systems, higher costs are driven by the use of more internal heads and possibly the use of equipment that produces a higher level of BTUs per unit. If your project is a small one that is focused, for example, on simply heating and cooling a couple rooms with ductless units, the overall system size will be low and so will the costs. If you are planning to heat and cool your entire home with ductless units, a much larger system will be needed. For central systems, the size of the total living space that the system is heating and cooling will drive the cost. The installation cost will not vary too much since the same basic activities are required regardless of the system size, so the capacity of the system will be the primary driver of costs. Any home technology upgrade will come with a range of equipment options to choose from. Some equipment is on the lower end of the quality scale (sometimes called “contractor grade”). This may be driven by the efficiency of the system and the reputation of the manufacturer. Heat pumps have several ratings associated with them to indicate product quality, including the Heating Seasonal Performance Factor (HSPF), seasonal energy efficiency rating (SEER), and a sound rating. 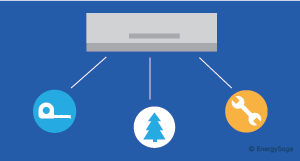 A heat pump HSPF rates its ability to heat an area efficiently, and the SEER rates cooling efficiency. The sound rating of an air source heat pump is simply a way to indicate how much noise it produces when operating. 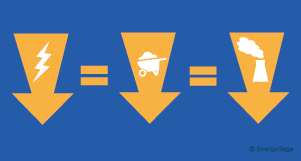 In general, equipment with higher ratings in these areas will cost more. The installation of ductless systems in each living space creates challenges for installers as they identify locations for housing the internal and external units and for routing the lines through the house to connect these units. Sometimes, there is easy access to an attic or crawl space for running the lines, but other times a much more complicated installation process is required. Jobs that are on second and third floors can also require use of special equipment that can come at an added cost. As noted above, central systems do not usually vary as much in cost since they are simply integrating with an existing distribution system. That said, if any adjustments to the ductwork are required, the costs may increase considerably. It is common that installers will include removal and disposal of existing equipment. For those replacing an oil heating system, some installers may include the removal and disposal of the oil tank, but others will charge extra for that. This can cost $500 to $1,000 and may be a good investment since it may be difficult to sell a home that include an unused oil tank since this is technically hazardous waste. Central systems have a host of bells and whistles that you can elect to include such as humidifiers and air filtering systems. Humidifiers tap into your water system to ensure that your home’s humidity levels are in line with your preferences. This can be especially valuable in the winter months. Air filtration systems can include thicker filter cartridges or can leverage UV lighting to purify the air. All of these extras come at a cost, usually between $250 and $1,000 extra for each feature. The cost of your air source heat pump system will depend on the type of air source heat pump you install, and whether that system is ducted or ductless. Ducted (or central) systems tend to be more expensive, but more standardized in cost since the installer will simply need to replace your old air handling unit that is already connected to your existing ductwork with an air source heat pump. If your home does not have a duct system already, installing a complete duct network in your home will add a significant extra cost ($15,000 to $30,000). However, you can always opt to install a ductless heat pump system if you don’t want to pay the extra money, or if you’re only looking for supplemental heating for smaller areas in your home. If you're installing one, ductless air source heat pump, then it will be less expensive than a ducted system. But, one indoor ductless air source heat pump will not be sufficient to heat or cool your entire home. If you're looking to use this technology as your sole source of heating and cooling, an entire ductless system is going to be much more varied in cost because the number of internal and external units needed will change based on the unique characteristics of your home. These units will have to be installed throughout the home in each zone you're looking to heat or cool, so overall costs can range considerably from a single story ranch home to a three story townhouse. Should you install ducted or ductless air source heat pumps? The type of air source heat pump you should get for your home depends on your goals, as well as the set up of your home. If you have an existing ducts and are looking to heat or cool your entire home, then a ducted system may make sense. Alternatively, if you don’t have existing ductwork, or are only looking to provide supplemental heating and cooling to a small area of your home, ductless air source heat pumps will get the job done. One of the biggest advantages of an air source heat pump is its efficiency. A well-installed air source heat pump system is capable of providing 1.5 to 3 times the amount of electrical energy it consumes in the form of heat energy for your home. This is possible because air source heat pumps move heat, rather than burning fuel. 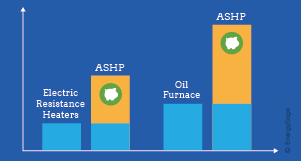 As a comparison, the best oil-fueled furnaces can only approach a 1-to-1 ratio of energy consumed to heat energy provided. 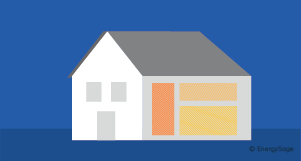 What kind of savings can you see from the impressive efficiencies of air source heat pumps? It varies depending on where you live, but the savings are significant. According to a from the Northeast Energy Efficiency Partnerships, air source heat pumps installed in the Northeast and Mid-Atlantic regions offered $459 in annual savings when compared to electric resistance heaters, and $948 annually compared to oil furnaces. Importantly, these savings will rise over time as air source heat pump technology improves and energy prices rise. In addition to the financial benefits of installing an air source heat pump, there are several positive environmental impacts of upgrading your building’s climate system. 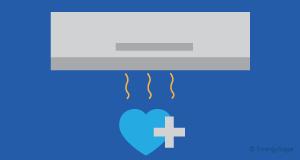 The high conversion efficiency of air source heat pumps means that you’ll use less fuel to heat or cool your home. This translates to less power generated at power plants from fossil fuels like coal and oil, which lowers the amount of greenhouse gas emissions and other pollutants entering the atmosphere. You can lower your carbon footprint even further by switching all of your energy use, including your heat pumps, from fossil fuels to solar electricity. Installing solar panels on your roof makes it possible to power your air source heat pump system (and the rest of your home) with free zero-emissions electricity. And as the falls across the country, the average U.S. homeowner breaks even on their solar investment by year seven. Pairing your home heating and cooling system with locally generated solar electricity is a cost-effective way to heat and cool your home while reducing your reliance on fossil fuels. Another benefit to using air source heat pumps is that you have the ability to heat or cool a particular room, or zone, in your building. This is particularly useful for property owners who experience persistently colder or warmer areas in their dwelling that they’re looking to regulate. Alternatively, it’s also useful for people who want to save energy and money by keeping different areas of their buildings at different temperature settings. For example, a homeowner with a multi-zone air source heat pump may choose to keep bedroom areas cool at night with air conditioning during the summer, but have a higher temperature setting in areas of the home that aren’t being utilized so that the cool air isn’t being put to waste. In comparison to other heating and cooling technologies, air source heat pumps are quiet to operate. Most notably if you’re looking to cool your home and use a window air conditioning unit, an air source heat pump system is significantly quieter (and more pleasant to use.) Air source heat pumps also serve as a good source for air filtration and dehumidification, and can make for more comfortable living conditions for people particularly sensitive to allergens or pollutants in the air.